Belcampo Meat Co., the sustainable, vertically integrated company that Anya Fernald and Todd Robinson founded in 2011, runs a ranch at the base of Mount Shasta and a series of restaurants and butcher shops around California. Belcampo clearly has vast reservoirs of beef fat at their disposal, which fills a fryer at each L.A. location: Grand Central Market, Mid-City, and Santa Monica. Kennebec potatoes are pressed skin-on through a cutter and rest in cold water for a minimum of five hours. From there, thin potato rectangles are poached in a fryer at 275 degrees, cooled, and re-fried at 375 degrees upon ordering - the result is crispy, golden fries with good give. 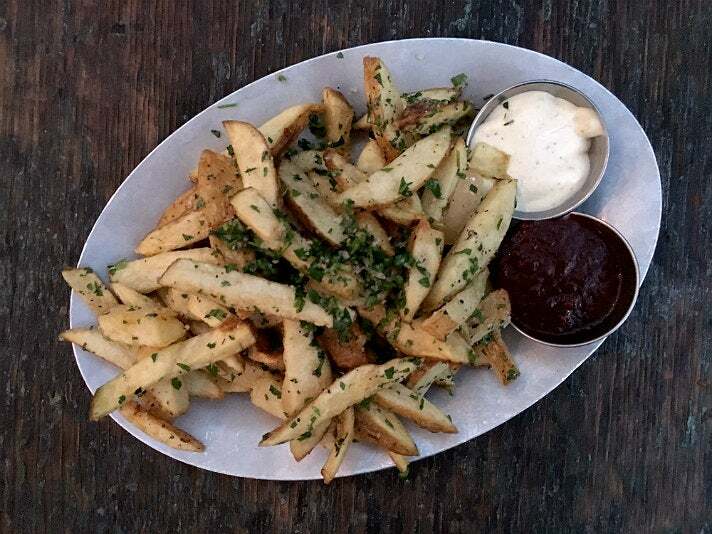 Belcampo’s fries are dusted with salt and served with punchy aioli and “dirty” ketchup. Chef Ted Hopson and business partner/beverage director Ann-Marie Verdi take a different path than most restaurants at The Bellwether, their seasonal comfort food restaurant in Studio City. Hopson and chef de cuisine John Cho dove deep into French fry science to keep their version crunchy, with creamy centers, and minimal residual grease. The process now spans three days. Hopson opted for Russet potatoes due to the optimum starch content, elongated shape, and inner softness. Potatoes are cut and brined overnight and rinsed the following day to shake off excess starch. They’re steamed in a combi oven until fully cooked, frozen overnight, and dropped into Canola oil upon ordering. Golden batons are supple inside and served with house hot sauce and tangy chive crème fraiche. 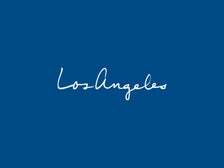 Thomas Keller’s sole L.A. stronghold is a grand, 17,000-square-foot structure facing a well-manicured lawn, with bar seats lining a colonnade, an airy dining room with canary yellow walls and TK inspired emblems, and a balcony facing Montage Beverly Hills. Unlike at his fine dining destinations The French Laundry and Per Se, Bouchon showcases more approachable French classics. 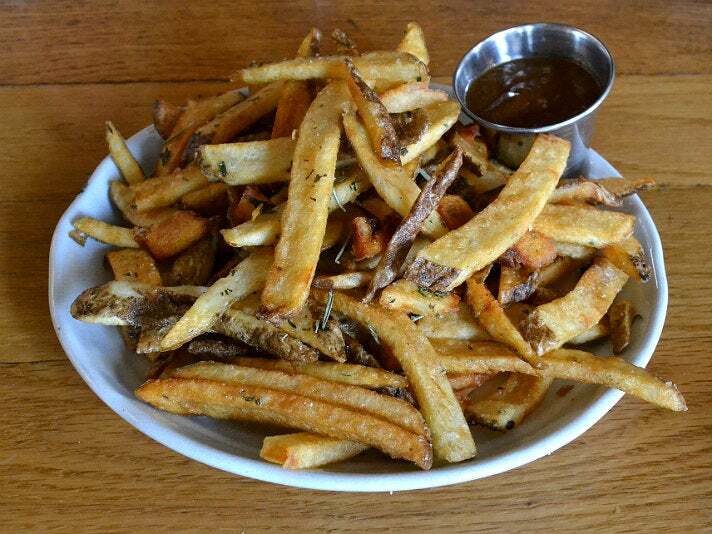 Skin-on pomme frites feature Russet potatoes that are crisped in peanut oil until golden. These fries are good on their own, and great with steak, where they run through molten maître d’hôtel butter. 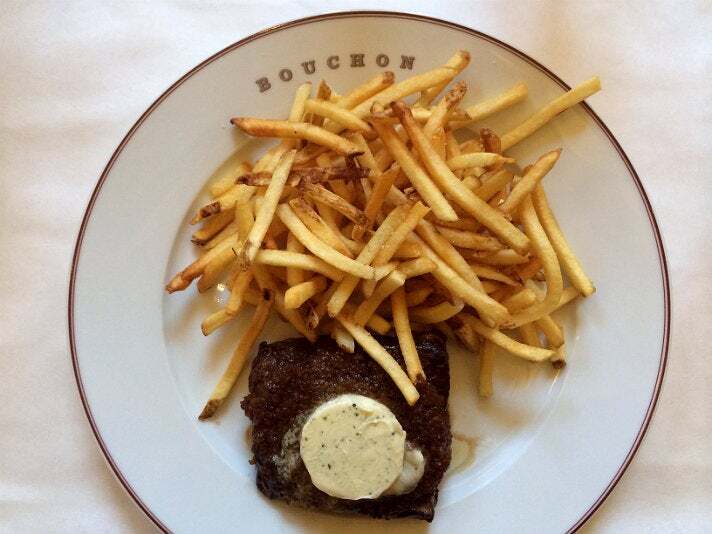 Bouchon also serves a rather luxurious plate of frites showered with shaved black truffles. 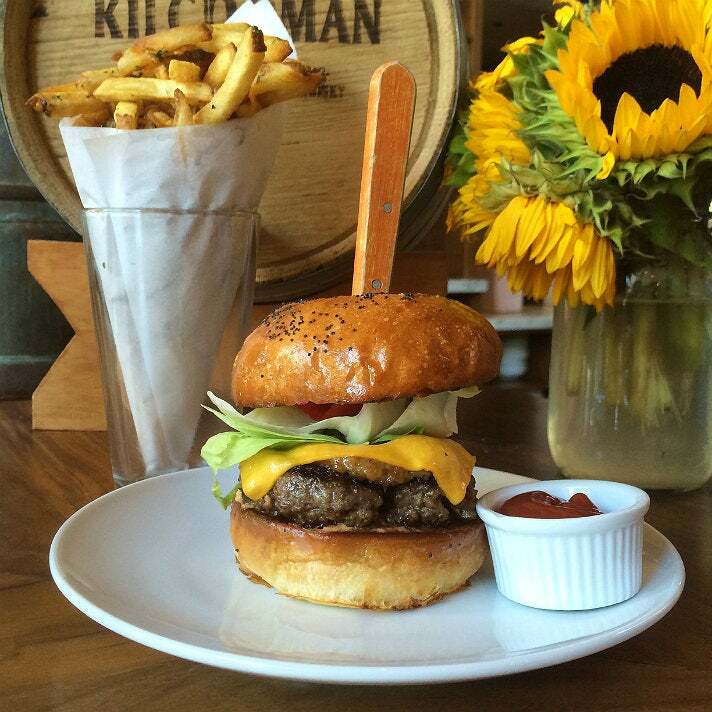 Sang Yoon may one day sleep on a bed of cash based just on sales of his iconic burger, but this chef excels in many other areas. At Father’s Office, the tiny Santa Monica pub that he transformed into a destination and helped fuel a Helms Bakery spinoff, people also order a parade of other plates and basket upon basket of frites. To create their fries, Father’s Office starts by blanching Russet potatoes in a blend of vegetable oil and lard, and then fry again before serving crispy matchsticks with potent garlic parsley aioli. Gjusta, the multifaceted bakery-café-deli-coffeehouse-restaurant from chef Travis Lett and Gjelina business partner Fran Camaj, doesn’t have a sign out front. Not that they need one. Venetians and tourists swarm the side street, which features a marble counter and boho chic back patio, to enjoy market-fresh comfort food, with the majority of edible building blocks made in-house. 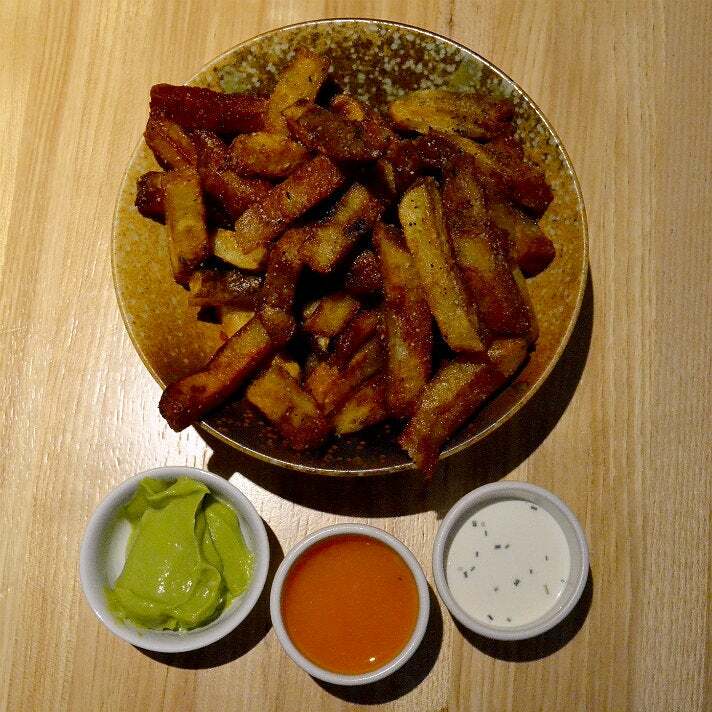 Their French fries are hearty and satisfying, skin-on wedges fried in peanut oil and served with ramekins of aioli and harissa ketchup. 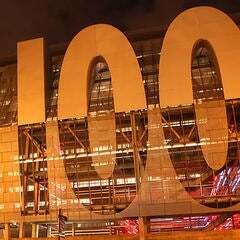 Visit Gjusta later in the day if you want to improve your odds of snagging a prized seat. Tony Alcazar and his partners in Whittier’s Bottle Room run this Old Pasadena sandwich shop and bar with wall to tall wood and bumping rock music. French dip sandwiches are the main attraction, but Alcazar also developed a delectable new French fry recipe. Kennebec potatoes are washed, pressed into half-inch cuts, and brined for up to one hour before they’re dried and plunged into scolding soybean oil. The results are frozen, fried at a higher temperature until crispy, and tossed with house-made dried garlic salt. Harlowe’s fills a bucket with fries, which are crispy, but with slight chew, and served with a ramekin of tangy house-made ketchup. Petit Trois, the tiny counter only bistro from famed French chef Ludovic “Ludo” Lefebvre and business partners Jon Shook and Vinny Dotolo helps brighten a Hollywood strip mall that also houses sister restaurant Trois Mec. 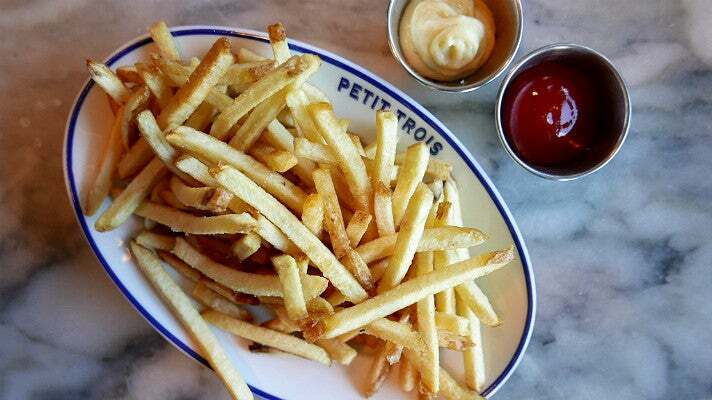 Ludo cuts loose at Petit Trois, serving optimum versions of dishes he grew up eating, including frites. Initially, he used beef tallow to fry skin-on Kennebec potatoes, but switched to clarified butter, which he insists is “much, much better!” Ludo also takes three days to make his fries from scratch, cutting and leaving the potatoes overnight in cool water on day one, blanching them on day two, and cooking them to order on day three. Crispy, skin-on fries are liberally salted. Ketchup and/or aioli are available upon request. 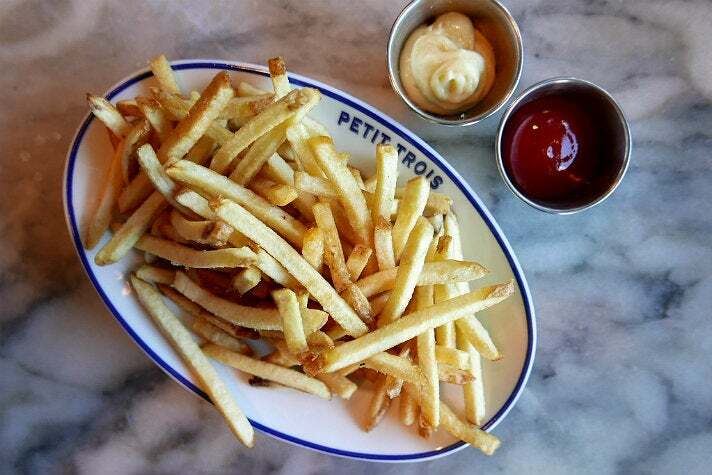 Petit Trois also allows customers to order their frites slathered in house-made Mornay sauce, which won’t hurt anything. 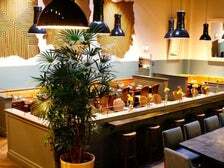 San Diego native Walter Manzke trained in some stellar French kitchens and now he and wife Margarita Manzke take the genre for a California spin at Republique, one of L.A.’s most popular restaurants. Walter fills a paper cone with crispy, addictive French fries whether you order a dry-aged burger or just want a standout side. He cuts Kennebec fries thick and rinses them with cold water to limit starch. 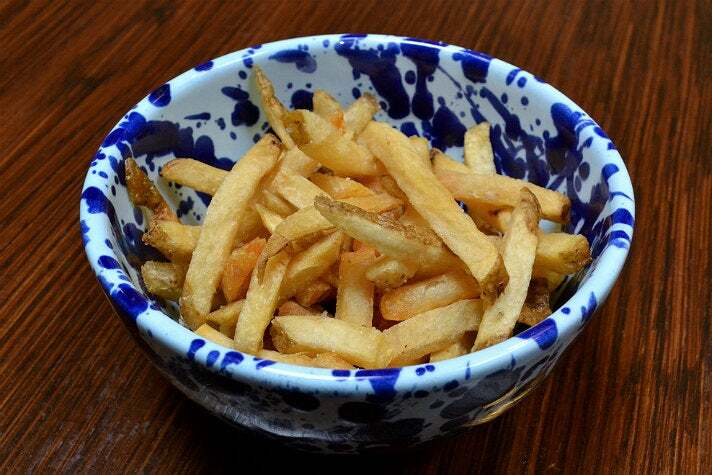 The fries are steamed until barely cooked, oven-dried to control moisture, and cooled until needed. Once an order comes in, the fries are hit with a flavorful one-two punch of peanut oil and beef fat, unless you’re vegetarian, which eliminates meat from the equation. 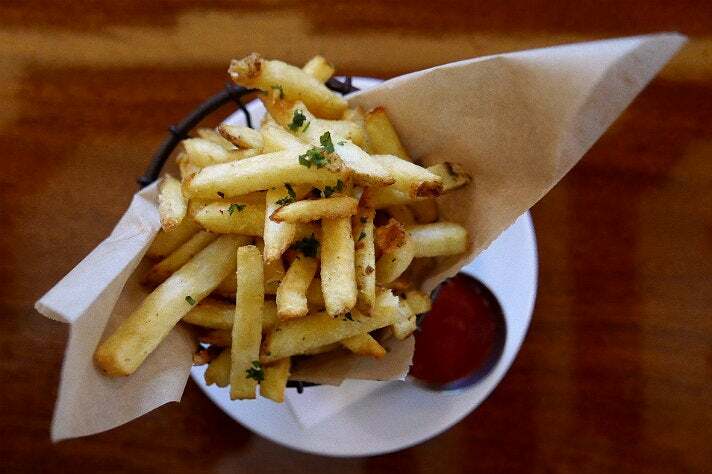 In either case, the fries are cooked until crispy and dusted with sea salt. Dip in ketchup and repeat. Chris Phelps and Zak Walters founded Salt’s Cure in West Hollywood in 2010 and relocated their seasonal nose-to-tail restaurant to bigger Hollywood digs in 2016. 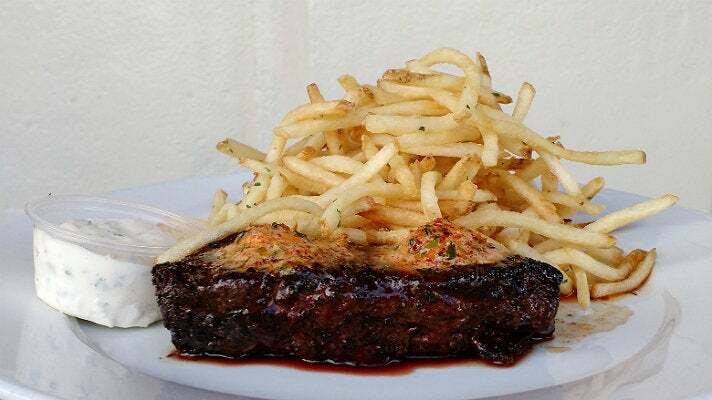 They put considerable care into each dish, whether it’s a Marin Sun Farms pork chop, Gonestraw Farms chicken, or their signature French fries. The duo hand-cuts Russet potatoes with a custom cutter with blades removed to form a more rectangular shape. The potatoes are fried in vegetable oil with rosemary, which tops the finished product. 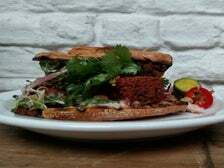 Each order comes with house-made ketchup, a flavorful slurry crafted with tomatoes, pickling spice, burnt onions, brown sugar and malt vinegar.